Demonstrations by French “yellow vest” protesters on Saturday, January 12, grew again, amid rising opposition among broad layers of the population to President Emmanuel Macron. Interior Ministry sources claimed 84,000 people demonstrated in the ninth straight weekend of mass protests against Macron, compared to 50,000 the week before—figures that, as even the official press noted, seemed to be substantial underestimates. Or perhaps one should say, buried or revived? Because for the mass of ordinary people, far from the political, financial, media centers of power in Paris, democracy is already moribund, and their movement is an effort to save it. Ever since Margaret Thatcher decreed that “there is no alternative”, Western economic policy is made by technocrats for the benefit of financial markets, claiming that such benefits will trickle down to the populace. The trickle has largely dried up, and people are tired of having their needs and wishes totally ignored by an elite who “know best”. Do not expect the French medias, all owned by the French 1%, to be objective when speaking about the Yellow Vests. We shall then look at the Sputnik News France to get a fair vision of the phenomenon. Here is a translation made by Le Saker Francophone after the 8th act, hold on January 5th. A German-French joint statement on Friday regarding Ukraine condemned Russia and demanded the immediate release of the sailors detained following the so-called Kerch incident in November. Moscow hit back in equally strong language summarily rejecting the Franco-German demand. France in Turmoil… Blame Russia! Well, what d’you know, regular as clockwork, Russia is being blamed – again – for “sowing social division” in Western states. This time, it’s the ongoing nationwide public protests in France against economic austerity which some Western media outlets have claimed are being “amplified” by Russian influence. So it appears the privatization of France isn’t going quite as smoothly as planned. As I assume you are aware, for over a month now, the gilets jaunes (or “yellow vests”), a multiplicitous, leaderless, extremely pissed off, confederation of working class persons, have been conducting a series of lively protests in cities and towns throughout the country to express their displeasure with Emmanuel Macron and his efforts to transform their society into an American-style neo-feudal dystopia. 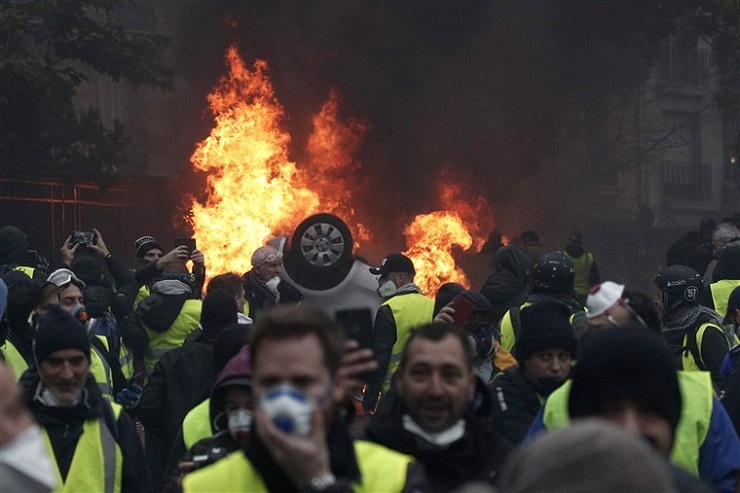 Highways have been blocked, toll booths commandeered, luxury automobiles set on fire, and shopping on the Champs-Élysées disrupted. What began as a suburban tax revolt has morphed into a bona fide working class uprising. The Yellow Vest Movement – weekend 8 and 9 December – Round 4. Some say, they are the worst riots in France since the student-driven mini-Revolution of May 1968. Over the four weekends, hundreds of thousands were in the streets, middle class people, from students to workers to outright employees and housewives. The police force increases by every new Round – and so do the demonstrators. Today – more than 8,000 police, a considerable increase from last weekend’s 5,000-plus. Tens of thousands Yellow Vests demonstrated; police reported more than 1,600 arrests. The bloody Egyptian dictatorship of General Abdel Fattah al Sisi is banning the sale of yellow vests, as protests spread internationally in sympathy with the movement against French President Emmanuel Macron. This came as “yellow vest” protesters in France rejected Macron’s offer of concessions in an attempt to placate the growing movement. President Macron is often presented as a Rothschild Boy. This is true, but secondary. Thierry Meyssan demonstrates that he owes his electoral campaign mostly to Henry Kravis, the boss of one of the world’s largest financial companies, and to NATO – a considerable debt which weighs heavily today on the solution to the Yellow Vests crisis. 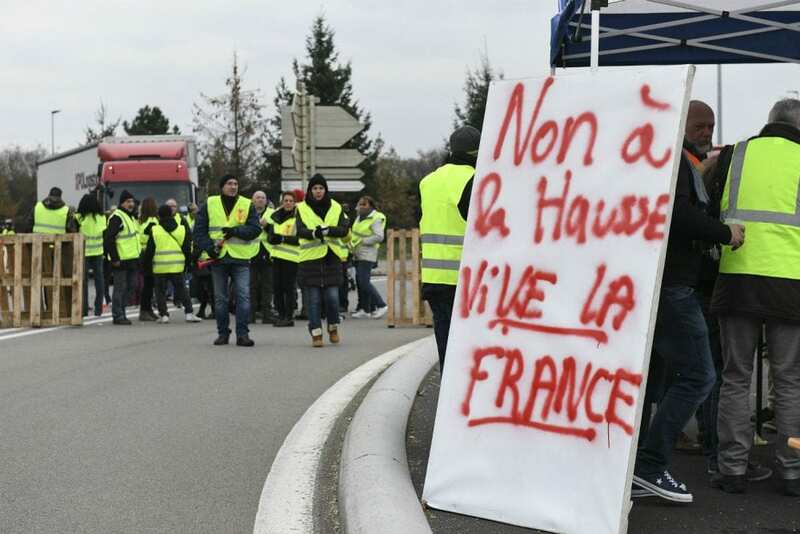 With the fourth Saturday of “yellow vest” protests against President Emmanuel Macron, a mass movement is clearly emerging among workers against the capitalist system. Macron’s withdrawal of the regressive fuel tax hike that initially triggered the protest resolved nothing. Among the “yellow vests,” demands for social equality, large wage increases, Macron’s ouster, eliminating the privileges of the super rich, an end to militarism, and for general strikes and a revolution are coming to the fore. From the Island of La Reunion to the Napoleonic symbol that is the Arc de Triomphe, through big and small towns, as well as the usually bucolic countryside in France, there is something special in the air: the smell of fires on barricades, the smoke of tear gas, the anger built upon decades of inequality, injustice and despair for most. Among the Gilets Jaunes, many understand intuitively that the current democratic process is dead, and therefore the only option is the occupation of streets and roads.